Zeran Li, as an undergraduate student in biological sciences, led a research team that uncovered an enzyme’s role in the regulation of eye size in the fish. So if the enzyme’s role is similar in human eyes, could it also be relevant to human vision problems, such as nearsightedness and farsightedness? These vision problems, called refractive errors, occur because the physical length of the eye from the cornea to the retina is different from the optical length. If an eye is too long or too short, light is focused in front of or behind the retina and vision is blurred, she said. Refractive errors affect 3.8 billion people worldwide, according to the International Center for Eye Education. Li worked in the laboratory of Yuk Fai Leung, a Purdue assistant professor of biological sciences. Leung oversaw the research and guided the team, but credits the two undergraduate students in his lab for the idea. Could a chemical’s effects on fish eyes offer a clue for correcting vision problems? Zebrafish are used as a model to study development and growth problems. The zebrafish, which are named for their naturally occurring black stripes, must be made transparent to enable the careful observation and imaging necessary for the research. The most common way to achieve this transparency is to treat zebrafish embryos with a chemical called phenylthiourea that blocks the formation of black pigment, Leung said. Li had previously observed that zebrafish embryos treated with the chemical have smaller eyes than untreated fish, and found that in addition to blocking pigmentation, the chemical inhibits thyroid activity. The thyroid produces hormones that regulate metabolism and influence growth, and it was thought that a general suppression of the thyroid hormone could be causing the reduction in eye size. Li theorized that phenylthiourea might suppress thyroid hormone production because it shares the same structure as a known thyroid hormone inhibitor. She tested the effects of several different inhibitors and found that not all had the same effect on eye growth. Only those that halted production of the enzyme thyroid peroxidase resulted in smaller eye size. 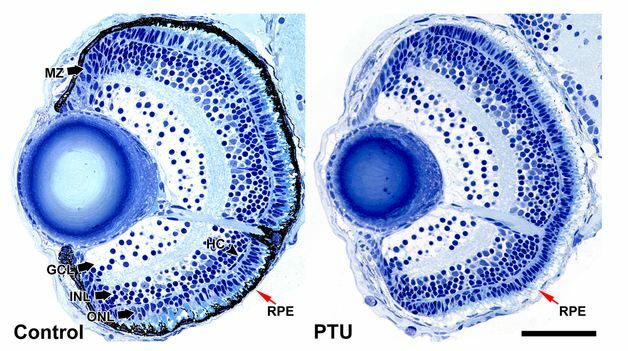 The team plans to further investigate the relationship of thyroid peroxidase and thyroid hormone on eye growth and development. Leung said the team also is analyzing the effects of traditional Chinese medicines considered good for vision, using fish models of human retinal degeneration. “Hopefully our efforts will expedite the discovery of novel treatments for human eye diseases,” he said.